I'm off to Hawaii next week (more info on what's gonna happen in regards to updates at the end of this post), and one thing you don't want to be doing when the Aussie dollar is in the state that it is currently in is take a trip to the USA, any currency I hand over to get changed to the greenback instantly gets cut by a third - a hugely depressing experience. So unless the dollar takes a massive surge sometime over the weekend I am in full penny-pinching mode, however the search for the perfect parma does not abide by such trivial things, so I checked my "parmas to try" list with one thing in mind ... is it cheap? Low and behold, I came across the All Nations Hotel. On any other day the parma runs a pretty standard $22.90 however on Thursdays (Classically an odd day to have a parma special) they offer up a parma and pot for a measly $16. Lock it in, target aquired, prepare for parmination. From the moment I walked in the door I could tell I liked the All Nations. A quiet, backstreets local in suburban Richmond. We were greeted with an enthusiastic hello from the barman, grabbed a pint and took a seat while we waited for the rest of the group to arrive. The All Nations just screams "friendly local". 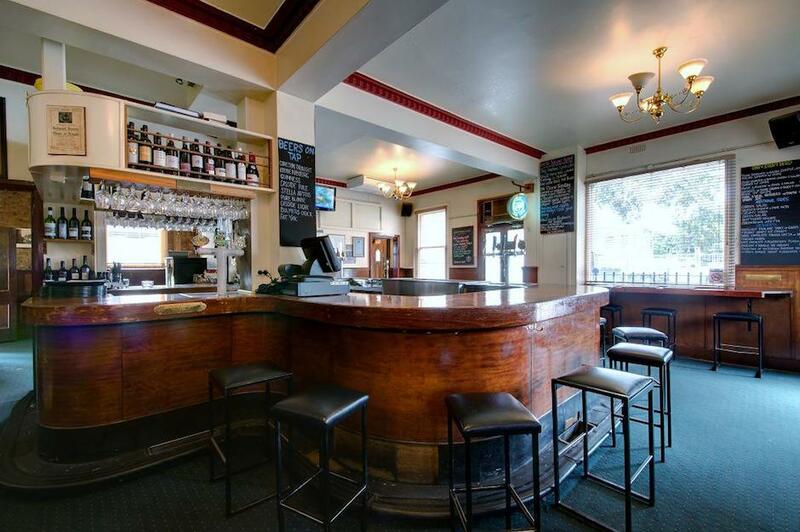 There's a large main bar area (pictured above) as well as a smaller dining area known as "The Snug" around the side. Once everyone arrived we grabbed our menus, as it was a lovely spring night (God bless daylight savings) we opted to head out the back and check the beer garden. Parmas ordered. Along with our free pot of Endeavour Pale I grabbed a pint of Lucky Duck (beer, not cider). Both were lovely beers, although I think I actually preferred the free pot of Endeavour over the Lucky Duck. There's not too much in the way of craft beer if your tastes skew that way (taps were Carlton, Blonde, Peroni, Fat Yak, Lucky Duck, Melbourne & Guinness), but I'm sure you'll find something to quench your thirst. The schnitzel was impressive, A massive bird with crunchy crumbs and thick as all buggery. It was slightly dry, but not criminally so, and conservatively crumbed. For only $16 this was an impressive schnitzel, and I challenge any man to walk away hungry from this bird. The toppings, however, are where the All Nations parma started to stumble. The napoli in particular was a huge detriment to the dish. There was plenty of it, but it was extremely thick, almost like pure tomato paste with a slightly burnt quality as if it had been left on the stove for too long, completely overpowered the dish. The cheese was better, well cooked and cood coverage with what I detected as quite a bit of tasty cheese thrown into the mix, giving it quite a sharp punch, which I've always been a fan of in the cheese blend for my parmas. If there was ever a parma that desperately needed a slice of ham, this is it. The richness of the napoli and the sharpness of the cheese would have been much less of an assault on the senses had there been a slice of ham to break it up a little. Halfway through this parma I realised what it reminded me of - The London Tavern, which we reviewed back in June. Also a massively thick, L shaped schnitzel, also desperately needed some ham, also very heavy on the tasty cheese in the cheese mix and also on Lennox St. in Richmond! Maybe they have been exchanging ideas because the two parmas could have been siblings. The garden salad had some great flavours through it, and I enjoyed it quite a bit - However the leaves were fairly wilted as if it had been sitting in a bowl in the kitchen for a while, so nothing at all to write home about. For $16 with a beer there is absolutely nothing to complain about in terms of value for this parma, If I had've paid the full price of $22.90 I probably would be being a little more picky, but for that price it's really hard to complain without sounding super petty. Hopefully the burnt napoli was just an isolated incident and next time around it will have improved. I really enjoyed the All Nations Hotel, definitely a spot to keep in mind as a spot for pre/post footy drinks (they even run a courtesy bus to and from the G on game days). The beer garden is right up my alley and I can definitely see myself stopping by for another pint or two in there. The parma is decent, but not without a few issues, with a bit of work it could be one of the better Thursday night deals I know of, I wouldn't rush to check it out, but definitely worth poking your head in if you find yourself in the area.